Demonstrators in Amman call on Jordanian government to take action to return areas in Israel to Jordanian sovereignty. A mass demonstration was held in Amman, the capital of Jordan, on Friday, in which protesters demanded that the lands of Baqoura (Naharayim) and Ghumar (in the Arava region) be returned to Jordanian hands. According to the 1994 peace treaty between Israel and Jordan, these areas are currently under Israeli control for 25 years, and after the end of the lease period, each party may demand to cancel the existing arrangement. The demonstrators called on the government to demand that these territories return to Jordanian sovereignty, and also called to cancel the peace agreement with Israel, expel the Israeli ambassador and close the Israeli embassy. "The people want national honor," and "the story is about national sovereignty," the demonstrators shouted. Despite the fact that Jordan has a peace treaty with Israel, the country’s parliament, which is made up mostly of Islamists, remains anti-Israel and its members have more than once called to annul the peace treaty. Last year, the Jordanian parliament approved a proposal to establish a committee to reevaluate all formal ties with Israel, including the peace agreement. 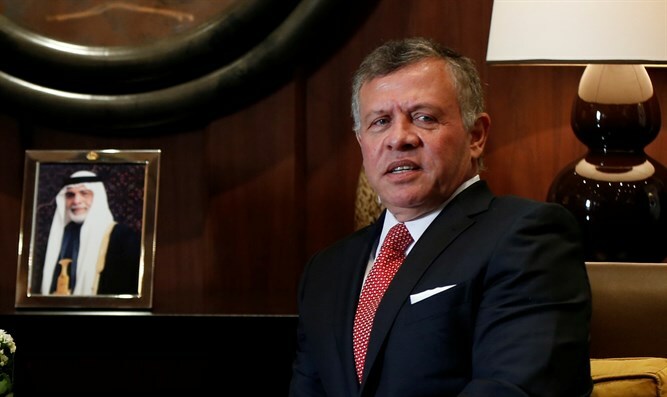 That decision does not necessarily mean that the peace accords with Israel will be annulled, as such a decision requires the approval of the government, the royal palace and the council advising Jordan's King Abdullah II. Last summer, Jordanian lawmakers voiced support for three terrorists who murdered two Israeli Border Police officers near the Temple Mount, praising them as “martyrs”. Several years ago, Jordan MPs unanimously demanded the government expel the Israeli ambassador from Amman as a punitive measure after detectives in Israel detained the mufti of Jerusalem on the Temple Mount.